Evan Hoyt was a winner in Portugal. Pic: Owen Morgan. Welsh tennis star Evan Hoyt has continued his successful start to 2019 by picking up his first singles title of the year. Hoyt, who has already won three doubles titles this year, won the singles title at the $15,000 ITF World Tennis Tour event in Portugal at the weekend. The Llanelli product clinched the title with a straight sets final victory over home player Tiago Cacao in Portimao. 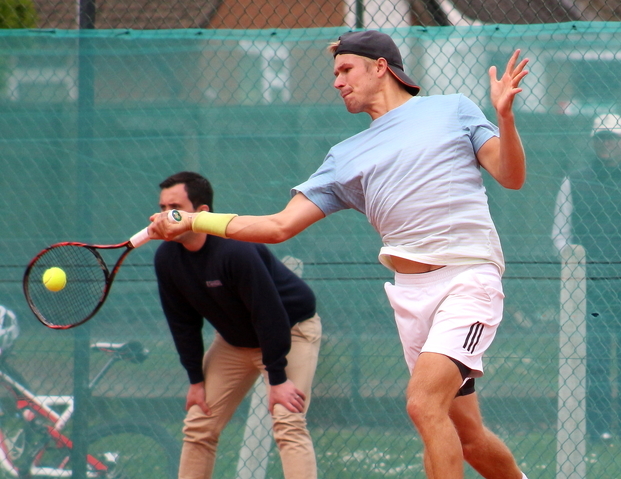 Hoyt was in excellent form going into the tournament having won ITF World Tennis Tour doubles titles in Tunisia, Barnstaple and Glasgow this year, along with reaching the singles final in Tunisia and semi-final in Glasgow. The right-hander started his singles campaign in Portugal with an emphatic 6-1, 6-2 first round win over Leonid Sheyngezikht, of Bulgaria. This was followed up with a three set win over Ireland’s Peter Bothwell. Hoyt took the first set 6-3, before the Irishman hit back to take the second 4-6. However, Hoyt was far too strong in the decider, claiming victory with a 6-0 success. The quarter-final provided a huge challenge in the shape of Argentina’s Tomas Martin Etcheverry, who pushed Hoyt all the way. Evan Hoyt. Pic: Owen Morgan. The Welshman took the first set on a tie break 7-6, before the Argentine hit back to win the second, also on a tie break. However, Hoyt once again proved too strong in the final set, edging the decider 7-5. The semi-final witnessed another three set triumph, this time against Colombia’s Alejandro Gomez. For the first time in the tournament Hoyt lost the first set 6-7, but battled back to level the match by winning the second 7-5 and went on to take the honours by winning the final set by the same score. This set up the number seven seed for a final against home favourite Cacao. But Hoyt took control of the match by taking the first set 6-3 and went on to clinch victory by claiming the second set 7-6, to claim his first singles title since winning the Australian Futures event in Brisbane last October. Hoyt and fellow Brit Luke Johnson, who partnered him to victory in Barnstaple and Glasgow, were knocked out in the first round of the doubles in Portimao by Britain’s Jonathan Binding and New Zealander Finn Tearney. Hoyt is back in action in Portugal again this week where he competes in the $15,000 ITF World Tennis Tour event in Quinta Do Lago. His tournament begins on Tuesday with a chance of revenge against Binding and Tearney in the doubles, while he starts his singles campaign against Dragos Dima, of Romania.